Houses and buildings that are built away from city sewage lines must depend on a private sewage system to handle waste disposal from the household plumbing system. A Septic System is a self-contained, underground wastewater treatment system that processes wastewater and sewage from your home's sinks and toilets. Septic Systems are designed to decompose solids and treat sewage by bacterial action, and then allow the residual to seep away into the earth. A Septic System consists of a sewer pipe, septic tank, and a drain field. 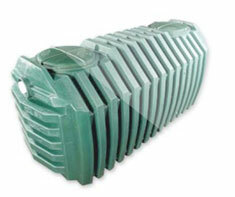 The septic tank is a watertight box, usually made of concrete or fiberglass. Wastewater flows from your home to the septic tank through the sewer pipe. The septic tank treats the wastewater by holding it in the tank long enough for solids and liquids to separate, and the solids to be broken down by naturally-occurring bacteria found in the waste. The separated out liquid then flows out through the drain field, typically made of perforated clay pipes. Shown in the 'Routine Care' section are the recommended routine maintenance tasks for your septic system. The 'Q & A' section shows answers to common questions. And the 'Articles' section provides helpful articles about your septic system.